Things are buzzing at the Hollywood Casino Ampitheatre in preparation for the biggest hard rock shows this year, including Shinedown, Avenged Sevenfold, Rob Zombie and Five Finger Death Punch! Can’t decide between them?? Now you don’t have to – the Ticket To Rock is back in 2018, offering you one fantastic deal to four phenomenal shows!! If previous years are anything to go by, these tickets are super popular, so don’t delay in getting yours!! 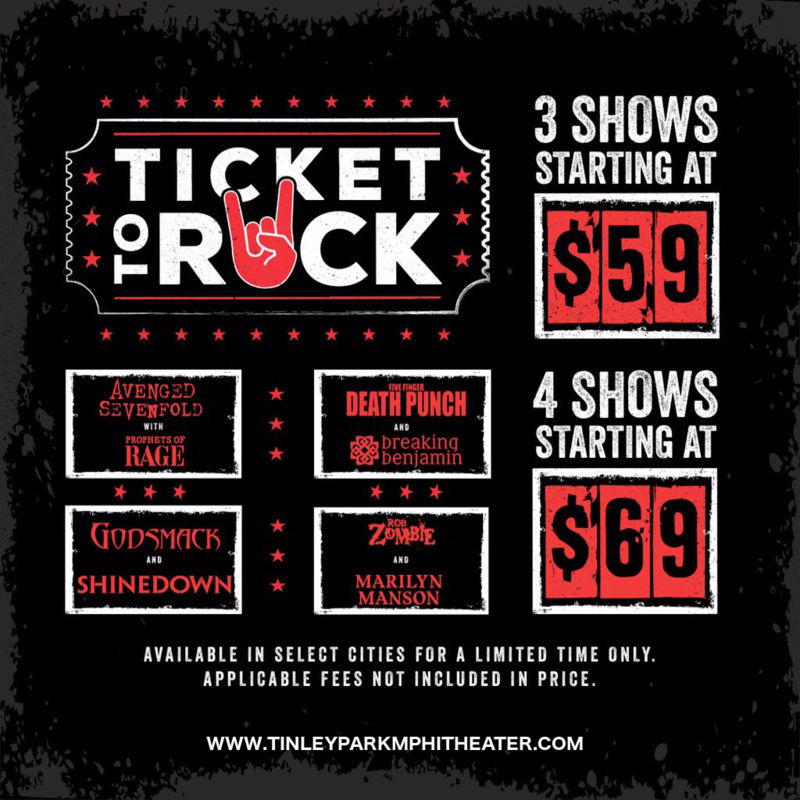 Hit the “Buy Tickets,” now for your pass to a summer of rock!! First up on the Ticket To Rock bill are the Twins Of Evil – Marilyn Manson and Rob Zombie, known for their over-the-top and theatrical live performances! Next, it’s time for some never-before-heard material from Shinedown and Godsmack, both with new albums due out this year. Following that, it’s Avenged Sevenfold and Prophets of Rage – and if you still have any energy by the end of all that, it’s time to round it off with Five Finger Death Punch and Breaking Benjamin!! If that doesn’t sound like an awesome deal to you, we don’t know what does – those tickets won’t last, so get yours while you can! !